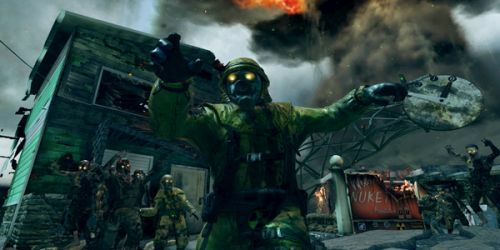 A new Call of Duty: Black Ops 2 patch is incoming, this time featuring the free Nuketown 2025 Zombies map for all Xbox 360 users! We have the full list of notes on the changes/tweeks being made, so take a minute to read on. Treyarch recently released patch notes on their latest update to Black Ops 2. Apart from the large assortment of improvements to the gameplay (like spawning and weapon improvments), a favorite community Zombies map, Nuketown 2025, will be available for purchase as a standalone download (400 MSP). Initially, Nuketown was offered only as a pre-order bonus, now open to all Xbox 360 owners on March 13th. Like dress-up for your favorite weapons. Each themed pack contains a unique weapon camo, three targeting reticles (one each for the Reflex, EO Tech, and ACOG sights), and a custom player Calling Card. All that stuff comes as a set for 160 MS Points (£1.37 / €1.92 / $2.00), One notable example: the Bacon Personalization Pack (!) wraps your favorite weapon in the most delicious cured meat known to man. This one's for the players who requested even more loadouts and/or are fans of Theater Mode. You can now get 10 more Create-a-Class slots (giving you 20 total if you've gone all the way up to Prestige Master) and significantly expand your media storage, allowing you to archive 20 more emblems, 32 more films and 40 more screenshots for 160 MS Points (£1.37 / €1.92 / $2.00). These packs include national flag-themed Calling Cards from countries around the world. Packs are divided by geographical region and costs 80 MS Points (£0.69 / €0.96 / €0.96), per region pack. Addressed an issue with the Collector's Edition camo un-equipping from weapons. Fixed an issue with the planted bomb disappearing at the "B" site on Hydro when the water floods. Resolved an issue with C4 and Bouncing Betty's killing players on contact. Fixed an issue with the stats tracking for the Executioner's Accuracy in the Combat Record. Page created in 0.2486 seconds.